Compared to other apartments I have lived in, they keep up with appearance, best place I have lived in a while.submitted by Brandi V. - Apr 01, 2019 |Recommended: YesThe office staff is kind and understaning, willing to help if they can. Decent for the pricesubmitted by Amanda W. - Mar 30, 2019 |Recommended: YesI've lived here for 4 years with minimal issues. Staff is hit or miss, some are kind and courteous, others need an attitude adjustment big time. Amber is always super pleasant to talk to, I appreciate her. I will say when the new managers took over they changed the rent due date and I was not notified resulting in a late fee, kind of irritating. Great place to live, only a few small issues.submitted by Caitlin M. - Jan 04, 2019 |Recommended: YesIt's close to a lot of fun events and activities. We love everyone who works here, they are helpful and respond in a timely manner. Our main issue has been hearing our neighbors, it is very loud and inconvenient to wake up to loud music or arguing almost every morning. I wish the lighting in the bedrooms were brighter, at night it is very dark. Parking hasn't been an issue for me. I've been here for a year and a half and I haven't had too many issues. Good locationsubmitted by Steven B. - Dec 28, 2018 |Recommended: NoGood location. 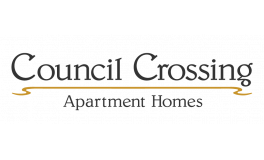 Great Starter Apartments or New Family Livingsubmitted by Jessica R. - Oct 16, 2018 |Recommended: YesOverall, Council Crossing is a great place to call home. My Husband and I have lived here for about 3 to 4 years and we have had no major issues. The staff is friendly and generally responsive to noise complaints or maintenance requests. They communicate with the tenants regularly about pest control and other maintenance or management needs.